So, working off that back-log... I actually made this with leftover christmas ham in January, but I'm sure it'll be just as good as a quick dinner all-year round. Don't use new potatoes for this though, they're not starchy enough and the gratin won't be as creamy. 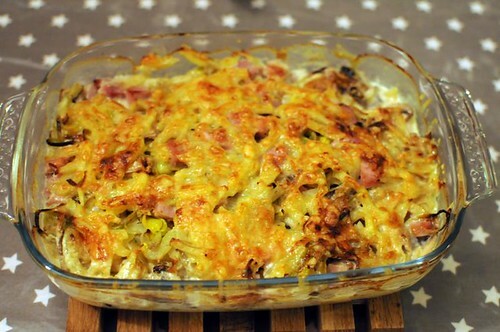 Layer potatoes, ham, leek and mushrooms in a buttered oven dish - the top layer should be potatoes. Whisk cream, mustard, a pinch of salt and some black pepper. Pour over the gratin. Finish with the grated cheese. Bake at 200°C for 30-40 minutes.